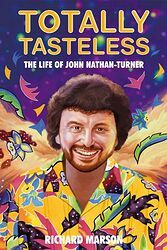 JNT was a a person who lived life to the max and it really shows in this excellent, well written book. Richard Marson, who's excellent biog of Verity Lambert is highly recommended, chronicles the good, the bad and the ugly in the amazing life of JNT. All the main players are there and everything, warts n all, is included. For me JNT comes through as a pretty decent person, loved by nearly all who worked with him, unlike his partner Gary who comes through as a pretty unlikable person.